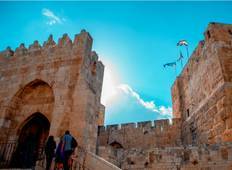 Find a Sightseeing trip that explores Israel. There are 43 tours to choose from, that range in length from 3 days up to 15 days. The most popular month for these tours is July, which has the most tour departures. "overall the trip was very well arranged. The pick and drop offs were good. The tour..."
"Israel is a beautiful country ! It's an architecture and the history is second to..."
"Absolutely loved the experience. We saw so much. Everyday was filled with places..."
"Great 3 day tour. Thanks!"